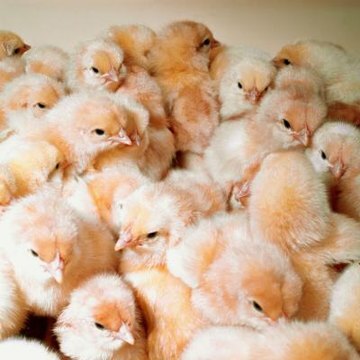 Many hatcheries sell newly-hatched baby chicks through the mail. You can build a flock that way or start with eggs and hatch the chicks in an incubator that you buy or make yourself. If you choose eggs, whether they come from your own chickens, from a neighbor’s flock or you buy them from a supplier, treat them carefully. Fertile eggs must start incubating within 10 days of the day they are laid or they’re unlikely to ever hatch. Chicken eggs require adequate warmth the entire three weeks they are incubating. Keeping the range between 100 and 101 F is ideal, but they can generally tolerate temperatures from 99 to 102. Anything more than a degree or so outside this range may cause the chicks to die inside the eggs. Once the chicks hatch, the temperature inside the incubator should be lowered to 95 degrees. Alternatively, move them to a warm brooder that is set to 95 degrees. The temperature for hatched chicks must be lowered about 5 degrees a week until they have all of their feathers.